We're full on into snow season here in upstate NY so I'm really enjoying my basement workshop. With the insulation of the earth, added insulation I put in the walls it is the most comfortable room in the house. I've decided that this year it is going to be all about the workshop. I might slip a small project in here and there; however, I'm going to give my workshop a makeover. When I started doing woodworking I wanted to just dive in and start making things. I'd grudgingly make jigs when forced; however, I'd also try to jury rig things or worse hold things by hand which resulted in a lot of mistakes and low quality work. It was probably two years before I stopped using loose chunks of 2x4 to hold up the off-cuts from my chop saw. When I finally made a very rudimentary permanent support I finally had my eureka moment. Stop jury rigging things. Since that moment, I've gotten a lot better. I've build a number of jigs to make my woodworking a lot more accurate and safe. However, I've never taken the time to give my workshop a full makeover. I'm still using the lumpy and uneven bench I inherited with the house to hold up my miter saw, I've got dust collection hoses stretched across my floor which create a tripping hazard and take up space. I don't have enough wood storage, my plywood is leaning against a wall, I've got old kitchen cabinets - also inherited - that aren't usable because they aren't accessible. As an added complication I'm getting work done on one of my foundation walls this spring. I've got salt from vehicle runoff in my garage infiltrating through the cinder block walls. The fix is pretty simple which is to clean up the block and install a vapor barrier. This should make the wall last longer than my life time. However, to get make room for the masons I need to clear out that area of my workshop. 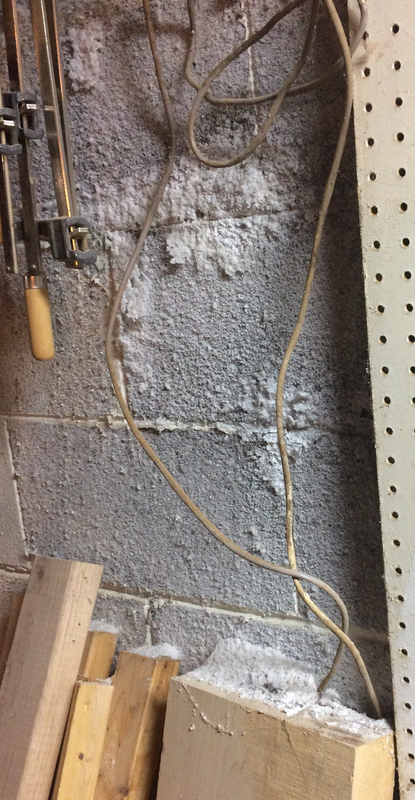 There's not much on the wall, just some pegboard and some power outlets I don't use. I'm thinking I'll just remove it all. I do have tools stored on that wall; however, I'm thinking I can come up with something more efficient. I also have some longer wood off-cuts from previous projects leaning against the wall. I have some ideas on what I'd like to do but the first step is getting an idea of what I have and what space I have to work with. Today I measured up my basement and made little cut outs for each of my tools. The washer, dryer and utility sink aren't going anywhere. I also need to leave enough space around them do get laundry in and out. The utilities - furnace, sump and hot water aren't going to be moved. The rest of the basement is fair game. 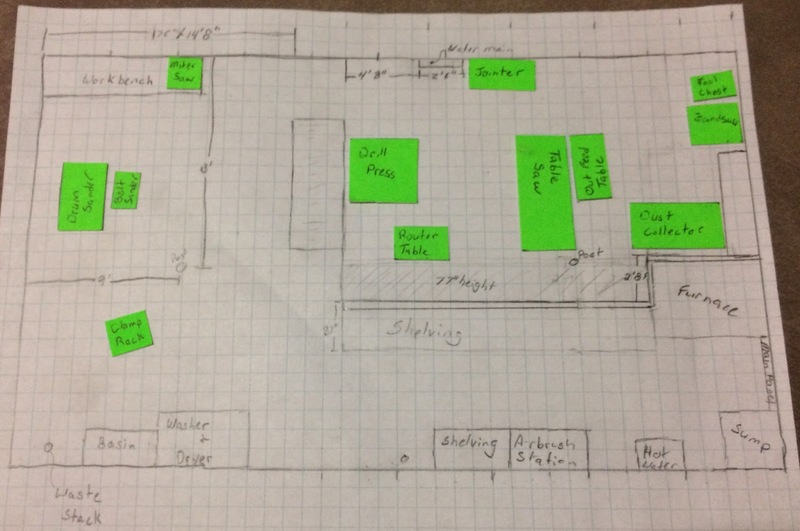 Next step, planning the new layout!